My Yak & Yarn group celebrated it's first birthday in March. My Y&Y ladies have become my great friends and we have, between us, produced close to a hundred crochet items for local charities - blankets, scarfs and hats. We are still going strong with new members joining at a steady rate. In June I attended my first ever fiber fest: Houston Fiber Fest (what fun!) and I recorded a review for the British Crochet Circle Podcast. This gave me an insight into the huge time commitment required in producing podcasts!! August marked my two year anniversary of teaching the Friday crochet and knitting workshop at my local store Nimblefingers. I love being part of the NF team and Friday afternoons are my absolutely favorite time of the week. In October I taught my largest group ever (20+ ladies) for the Chicks with Stix Chapter of my local knitting guild: the Knit at Night Guild. I gave a class on Crochet Borders for Knitted Projects which I totally overprepared for but I received great feedback afterwards so it was all worth it! Over the summer I learnt new techniques taking part in my first ever Crochet Alongs (CALs), three of them in fact, on crochet socks, interlocking crochet and overlay crochet. I also figured out Tunisian entrelac crochet making a blanket for Yak & Yarn. I will continue to write my blog, learn new techniques, run my Yak & Yarn group and my Nimblefingers workshop. I'd like to add another regular weekly teaching class.... we'll see. 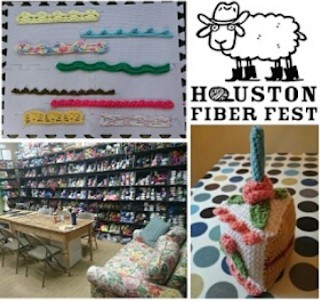 I'm also considering applying to teach a crochet class at the Houston Fiber Fest this year. This seems like the obvious next step in my teaching career. Nice set of goals Tamara! Thank you Fay! Let's see if I can stick to them! Happy New Year resolutions, Tamara! Like you, I have been using the end-of-year break to catch up on blogreading and also learning and revising crochet skills. You are doing many of the things I have toyed with in my dreams; e.g. teaching classes. I have the skills but how reliable will the body be? That is holding me back (as it does for a lot of things) therefore I am very proud that my biggest crafting achievement of 2016 was exhibiting at Maker Faire Adelaide (the biggest MF in the southern hemisphere). My goal for 2017 is to plan a class or workshop for the next MF. I am raising a glass to achieving our goals this year! Thank you Jodie! You did amazingly exhibiting at the Maker Faire. I was impressed. I find the idea of all the preparation, getting all the samples ready etc. all rather daunting. I think you'd be an incredible teacher. You have so much crochet knowledge to share. Good luck!! And a belated Happy New Year! I don't know how your comments appeared on my blog without the usual email notifications! Maybe I'm just sneaky! ;-) Thanks for the reply and the encouragement. The thought of a couple of workshops is very attractive right now but an exhibit is good for having a home base for all my stuff! I like to have a bit of everything so that I have examples if anyone asks. I do like the idea of an exhibit. I think people are always amazed when they see different examples of what crochet can produce. There are so many techniques and applications! Aaahh the joys of crochet!